How did an Ex-Slave and a White Mormon Become Famous Indians? Picture this: A white Mormon and an ex-slave marry and then travel around the country pretending to be Native Americans. That sounds like something out of a dime novel or a Hollywood film, right? In truth, it actually happened! During the 1840’s Lucy Stanton and Warner McCary earned a living by masquerading as Native Americans. On February 27, Dr. Angela Pulley Hudson will be coming to BYU to discuss the fascinating tale of this couple. The event will be held at 7 p.m. in the Harold B. Lee Library Auditorium. “It is an important glance into the fluidity of racial identity at the time, how people ‘passed’ for one race or another, and early moments of monetized appropriation of Native culture and religion by non-Natives,” said Dr. Brenden Rensink, director of the Charles Redd Center for Western Studies. Dr. Hudson will be discussing her book Real Native Genius: How an Ex-Slave and a White Mormon Became Famous Indians. In it, not only does she explore the lives of McCary and Stanton, she also examines Americans’ perceptions of Indians and how that impacted antebellum culture. “Before and during their marriage they shared a particular history of performing as Indians in a variety of contexts: from Mormon meeting houses to packed concert halls, temperance rallies to doctors’ offices. Their story ranges across the nineteenth century from the deep South through the Great Lakes region, to the Midwestern frontier, across the northern border with Canada, and into the Mountain West. Along the way, they entertained Americans from many backgrounds, penetrated the inner circle of the nascent Church of Jesus Christ of Latter-day Saints, and fled all sorts of legal jeopardy” said Dr. Hudson. “In contemplating the Indian character, there is an interest thrown around it, which cannot fail to impress the mind of every inquiring person, although the Indian race is fading away…there is a charm thrown around their past history, and the most lively emotions are created in the mind of the Patriot and Philanthropist in contemplating their past and present history, and are led to look upon the high and lofty bearing of the red man, with the most intense admiration,” said Rev. L. L. Allen in his book about Okah Tubbee. During the time of McCary and Stanton, the concept of Indianness was constantly in flux, and the two played a role in it. “They were not simply impersonating Native people—they were helping to shape the popular cultural phenomenon of Indianness,” said Dr. Hudson. Texas A&M University provided the following biography of Dr. Hudson: Angela Pulley Hudson joined the history faculty in 2007 after receiving her PhD in American Studies from Yale University. She specializes in American Indian history, the 19th-century U.S. South, the representation of American Indians in popular culture, and the intersection of American Indian and African American lives. She has held fellowships from the Newberry Library, the American Philosophical Society, and the Beinecke Rare Book and Manuscript Library, among others. The effects of a critical illness can impact your life and the lives of your loved ones years after the illness itself ends. Ramona Hopkins, director of the BYU Neuroscience Center, will address this relevant and personal topic at the 25th Annual Martin B. Hickman Outstanding Scholar Lecture. Her lecture, titled “Effects of Critical Illness on Patients and Families,” will expound on Post-Intensive Care Syndrome and how critical illness impacts both patients and family caregivers’ cognitive and psychological functions. The lecture will be held on Thursday, March 8 at 7 p.m. in room 250 in the KMBL (SWKT). Light refreshments will be served after the event. Dr. Ramona Hopkins has led and served the college in neuroscience and psychology for almost 20 years. She has multiple degrees in both nursing and psychology and uses her knowledge and leadership to direct the Neuroscience Center and to teach psychology and neuroscience. She is the recipient of a number of awards from BYU including the Young Scholar Award in 2004, the Karl G. Maeser Research and Creative Arts Award in 2010, the 2011 Jack Bailey Teaching and Learning Faculty Fellowship and the 2013 Sponsored Research Recognition Award. The lecture is in honor of Martin Berkeley Hickman, a BYU political science professor who served as the dean of the College of Family, Home, and Social Sciences from 1970-1986. As the dean, Hickman was instrumental in helping the college become what it is today by unifying the College of Social Sciences with parts of the College of Family Living. He also helped make possible the Women’s Research Institute, the David M. Kennedy Center for International Studies and the Family Studies Center. As for teaching, Hickman is recognized as the father of BYU’s American Heritage program as he organized, presided over, and helped instruct the course. Hickman was renown for his loyalty and dedication to his family, the Church, the college and BYU. 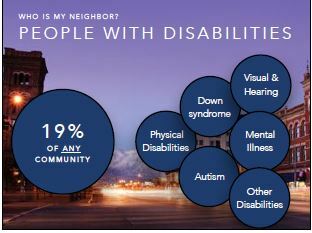 Of the approximately 526,000 people who live in the Provo-Orem area, 15,000 individuals have intellectual and developmental disabilities…and about 100,000 individuals have disabilities in general. In his 2018 Marjorie Pay Hinckley lecture “Fostering Belonging: Inclusion, Friendship, and People with Disabilities,” Cornelius Vanderbilt Professor of Special Education Erik Carter invited us to see these individuals for their strengths instead of focusing on their weaknesses and differences. In doing this, they will truly find worth and belonging in our congregations and communities. In his research and studies, Dr. Carter found that there is a pattern of 10 attitudes, actions, and experiences that lead to belonging. In a study conducted by Dr. Carter, 87% of people with disabilities said that faith was “somewhat” or “very important” in their lives, yet only 43% of individuals with significant disabilities attend worship services at least once a month. This is not a critique of these individuals, but a critique of our church buildings and services. We must have facilities and services that serve the needs of all members of the congregation and allow them to be present. Where and how we gather say a lot about our community and how we treat the people of our community. An announcement is a good first step and it may be intentional, but it is not personal. A true invitation is personal, lets the individual know that they are personally being thought of and that their presence really matters. “[Being welcomed] is not just about what you say, but rather it is more about what is felt. The host is not the one who determines what feels welcoming. It is the guest,” shared Dr. Carter. For the host (those who are doing the welcoming), the biggest threat to being welcoming is uncertainty. Ask about the needs of the individual and then ask about who they are. Parents of youth with disabilities say that they see a large degree of joy in their children. When you welcome that joy into your congregation, think about the joy they will give back. The charge to welcome individuals with disabilities is not only for close family, friends or a welcome committee, it is a charge for everyone. When you welcome someone into your community, they should not stay a stranger for long. Getting to know people is essential, but it is how they are known that is even more important. Don’t know people by simply their name, their labels, or their strength in overcoming their disabilities; see them for who they are and their strengths. Their friendship and joy are something to be shared and appreciated. We need to be personally involved with contacting all members of our community. This is not solely the responsibility of religious leaders, but it is again a responsibility for every member of the congregation. By embracing the person for all they are–both their attitudes of you and your attitudes of them–will be changed. Having a disability can be challenging, but even more challenging is doing it without the support of those around you. To be supportive you must show interest, ask for input, and ask good questions. Be an advocate for disability awareness efforts and an advocate for the family so that church can become the happiest and most supportive time of these individuals’ and their families’ week. Church only lasts for a few hours but fellowship needs to continue throughout the week. Truly caring for others means that we “recognize and strive to support the spiritual, emotional, and practical needs” of members even after we leave the chapel on Sunday. This care shows that the individual matters and that they belong. Couldn’t we all be a little more caring and concerned? We must be intentional with our relationships and take the responsibility of being the friend that our peers and community members need. Individuals with disabilities are “indispensable members” of a congregation who bring indispensable gifts and talents that can bless everyone in a congregation. Finding ways to be ministered to by people with disabilities will truly bless individuals in our faith communities who interact and learn from individuals with disabilities. Giving all individuals the opportunities to serve will serve us well. God sees everyone with value, worth, and love, so why should we strive to see people any differently? Loving people with disabilities and making sure that they feel belonging is not something that should be left to the experts, it is something that we should do ourselves. Go here for the full lecture or see below. One of our college’s most successful annual events, the Fulton Conference, is coming up at the end of this semester — and we want you to participate! The conference features research done by undergraduate and graduate students from the College of Family, Home, and Social Sciences. The Fulton Conference gives students the chance to partner with a faculty mentor and do academic research, but there are many additional reasons that students should consider presenting at the Fulton Conference. For example, conference participation looks great on a resume, the conference prepares students to present at other academic conferences, and there are cash prizes for the best research projects. How can you participate in the Fulton Conference? Posters are due on Thursday, March 29, at noon. The Fulton Conference will take place on Thursday, April 12 from 8:30-11:30 a.m. in the Wilkinson Center Ballroom. Here’s a more detailed list of tasks that you’ll need to complete in order to participate. To summarize, you’ll design a poster, upload a digital version to our college website, and stay near your poster to answer questions during the day of the conference. We can’t wait to see you at the 2018 Fulton Conference! Start brainstorming your research questions today.